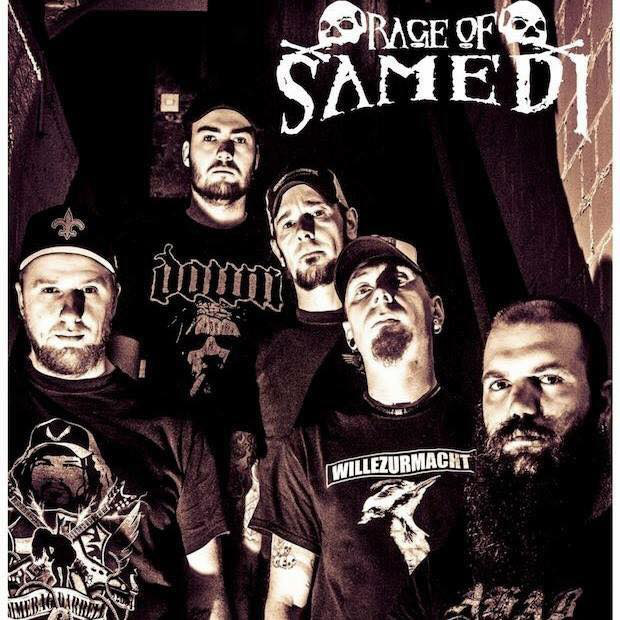 Rage of Samedi is a Doom/Sludge/Metal band who exists since September 2012. Started as a project the founding members Sam D. Durango (guitars/backing vocals), Lou Cifer (vocals), Paul 'Hate' McKay (bass) and Ian O'Field (drums) found out really fast, that they want to do more out of it. Clearly influenced by ClassicDoom bands of the 70s and early 80s and also of Sludge of the 90s 'til modern Sludge they give their own DOOM a special touch. !! !F***in' slow, f***in' evil, f***in' heavy!!! That's what the band themselves describes their music at an interview. They decided to record a demo to check out how their music reach people which was sold out really fast. Til' today they recorded their first album 'SIGN' by themselves which was mastered by Collin Jordan of 'Boiler Room Mastering' Chicag (...) Mehr anzeigeno who also worked with EyeHateGod, Lord Dying, Ministry and on. As the CD production was done and released 'DIY' in march 2014 they looked out for a label to help with the vinyl release. With 'Voodoo Chamber Records' and 'Buschlee Vinylaceton' they did that deal and 'SIGN' came out as a record in november 2014. The special gold edition was sold out at the pre-order and the band decided to do a tour in march 2015 which brings them to Germany, Switzerland and UK. Before the CD release a fan did a cover on youtube of the song 'The Lord' which was also included on the demo with an impressing solo on. The band asked him to perform it with them on the release party. He did and the band asked him to join as full member, and found with Dixieking Böhme I. their 2nd guitarist who made the line up perfect. Above time they got support shows with mighty bands like 'Karma To Burn'(US), 'Crowbar'(US), 'Dopethrone'(CAN), 'Opium Lord'(UK), 'King Heavy' (Chile), 'Iron Void' (UK) 'Lord Vicar' (SWE), 'Three Eyes Left' (It), 'Void Of Sleep' (It) In case of the awesome flow in songwriting they released their EP 'A psychopath job is done...!' at Nov. 13th 2015. Just a few days before the EP release Paul McKay left the band a bit surprisingly for all. Dissapointed of his decision the others thought and talked a lot what would happen now. Against their first thoughts that 'Rage Of Samedi' would be done if anyone of the original members would leave the band they decided to walk further on, cuz' they left to much blood, sweat and tears, smoke, drinks and beers in the past just to let it all loose in case of that one dumb decision of their former bass player.